Owwati was originally taken to the Ohio Bird Sanctuary in Mansfield, OH after a collision with a car. A juvenile at the time, she suffered head trauma and an injury to her left leg. In July 2013, she was transferred to the Medina Raptor Center and has become a educational ambassador for her species. 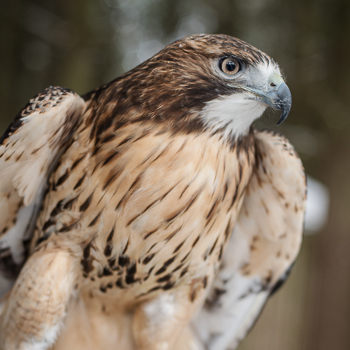 The most common and widespread hawk in North America, the Red-tailed Hawk is a bird of open country. It is frequently seen sitting on utility poles where it watches for rodents in the grass along the roadside. Most commonly with pale chest and dark band across belly. Extremely variable in appearance with light and dark forms. Tail reddish on top, with dark band near end. Tail lighter red below; unbanded. Light forms: Head darkish brown. Throat dark or white. Chest white or with rusty streaks. Dark band of streaks across belly variable, from very dark to nearly absent. Dark patches at leading edge of wing, and dark trailing edge. Back dark brown with white mottling; white forming loose “V” on shoulders. May show pale eyestripe. Dark form: Dark brown all over. May be rufous on chest. Tail red on top. In flight, front of wings dark, flight feathers pale, with dark trailing edge. “Harlan’s Hawk” is a dark form without red on tail. Juvenile similar to adult, but more streaked, and has brown tail with several dark bars across it. Breeds from Alaska to Labrador, southward to Mexico and the Caribbean, down to Panama. Winters from southern Canada southward. Found in open areas with scattered elevated perches, including agricultural areas, fields, pasture, parkland, broken woodland, and scrub desert. Sit-and-wait predator, usually watching from elevated perch. Also hovers in strong wind. Large bowl of sticks in tall tree or on cliff ledge. Lined with bark, green twigs, and other items. Populations increasing in much of North America, apparently in response to the widespread establishment of open, wooded parkland in place of grassland or dense forest.